ELLE: Charlotte, you’ve described your discovery of Nicolas’ clothes as a revelation. 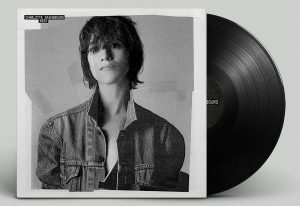 Charlotte Gainsbourg: When you find a silhouette that’s so close to your own…I felt like myself, and at the same time, I was taken somewhere else. Just looking at his clothes, you want to project yourself into them. 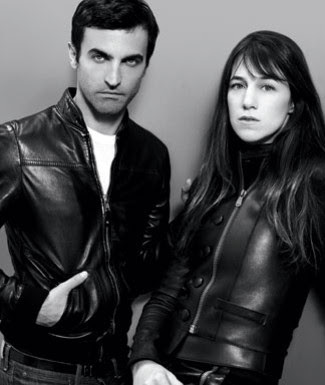 Nicolas Ghesquière: I had a feeling that I knew her before we met. One year, she wore a vintage Saint Laurent dress to Cannes; it was gold with one shoulder. Today, everybody would say, “Oh, wow, vintage!” But back then, it was completely out of time; it wasn’t right. To me, it was so right. I thought, She can wear that and be so cool? That’s someone I would love to dress. ELLE: It’s fitting, then, that one of your first big projects together was for Cannes in 2001. Gainsbourg: I was part of the festival jury and needed a wardrobe—10 days of clothes. You need something that puts a little distance between what you really are and what you want to show; it’s a shield, a protection. The first night at Cannes, we chose a suit that made me look like a little soldier, and that was exactly the feeling I had. Ghesquière: I didn’t want her in head-to-toe Balenciaga, like, “I’m wearing this brand.” I said, let’s mix, use some vintage, and choose things from your wardrobe. It’s naive, maybe, but I want you to look like you went into your wardrobe and put the outfit on. It has to tell that story. ELLE: Still, you both seem slightly wary of the red-carpet phenomenon. Gainsbourg: It’s not something that I do very well; I’m always embarrassed. You see pictures of all the beautiful girls who know how to pose and smile—I’m not a professional in that way. Ghesquière: I disagree! Few women are brave enough to take the risks you do. ELLE: Is that why you don’t dress more stars for these events? Ghesquière: It’s strange to see someone who’s so incredible in a movie suddenly become this nostalgic image of Hollywood glamour….It’s 2010. I’d rather work with someone who likes what I do than create something for the red carpet that won’t make me happy. It gives us visibility, but not the kind of visibility I’m looking for. ELLE: What is the essence of Balenciaga today? Ghesquière: Casual things elaborated upon from a collective idea of streetwear; sporty elements, which are a part of me; mixed with—and this is the difficult part—the graphic, radical tradition of Cristobal Balenciaga [who founded the house in 1918]. ELLE: Your clothes suit a particular type of woman, but a successful fragrance has to please a crowd. Ghesquière: I like the idea of touching more people than we can with fashion. What’s fun about Balenciaga— the handbags had a big success without advertising or promotions or logos. Suddenly, women wanted one because they saw another woman with it. It was like a tribe. With fragrance, I hope women will recognize one another as they did with the bags. ELLE: Charlotte, you started off by spritzing it on your luggage? Gainsbourg: I’ve never worn perfume before. I liked the idea that it spread into my clothes and the objects I was carrying before I actually wore it. Now I enjoy it on my skin, but it came gradually. ELLE: Being the daughter of Serge Gainsbourg and Jane Birkin must have had a tremendous influence on your style. Gainsbourg: I grew up with the idea that once you found yourself with your clothes, why change? In the ’60s, my mother was very trendy; she wore everything. But later it was jeans, old T-shirts, much more androgynous—the same stuff every day. My father, too, had the same pair of jeans, the same shoes, the same color. For a long time, my uniform consisted of a trench coat, wide flared jeans, and these little bottines—I copied a pair that my mother had in this theater place. I had, like, 10 pairs of the same shoes. Ghesquière: Amazing. It’s the hippie version of American Psycho! ELLE: Nicolas, people often describe your work as futuristic. Ghesquière: It’s called futurism because it has to be called something. But I don’t think it’s futuristic. More than anything, I’m designing for a woman of today. I want to be a witness of my time. But every Balenciaga show is like a laboratory. I put pressure on myself to propose something new—I think it’s the minimum that you can do as a fashion designer. ELLE: But what about all those sci-fi shapes? Ghesquière: I do love science-fiction and horror movies. Dario Argento films, De Palma’s Carrie and Blow Out, Alien, The Grudge. ELLE: Are your clothes supposed to be scary? Ghesquière: A bit. I like the scary part. That confidence, the distance Charlotte talked about? Clothes are a good way to define that. Balenciaga is architectural, strong. That’s what I like.